Pastor Errick Peck was born on November 22nd 1963 in Indianapolis Indiana. He received his grade school and junior high training from Mary E. Cable School #4 and Joyce Kilmer School #69. He graduated from Broad Ripple High School in 1980 at the tender age of 16. After a few life changing events happened, he accepted Jesus Christ as his personal savior and was baptized January 11th 1985. 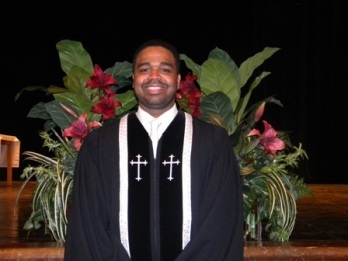 He joined Tabernacle Missionary Baptist Church under the leadership of Pastor Jonathan Bailey Sr. Working and growing in grace; he worked in the youth department as an athletic director implementing recreational activities for the church. Layman Peck also coached the youth basketball team ages 8-13 for 16 years! He developed a program to assist the youth, adolescent, and young adult called Career Day and was a group leader when they toured colleges out of town. He accepted and announced his call into the ministry to preach the gospel in February 1991, under pastor and long time Sheppard Jonathan Bailey Sr. God gave him new responsibilities after being ordained and licensed in August 1991. Reverend Peck was given permission to start a new member’s class and later with others, directed the birth of a youth new members class. He taught the new members class from its inception year of 1993 until November 2008. Also Reverend Peck volunteered to provide monthly bible studies at Options Treatment Center; A facility that provided temporary housing for adolescents with special needs. Reverend Peck was asked to become acting Pastor at Western Star Missionary Baptist Church for two months in lieu of a serious operation and recovery time for their Pastor, Reverend Joseph Edwards. In 1996 two major events happened in his life; Reverend Peck became a husband to psalmist Melissa Guthrie and Pastor Jonathan Bailey Sr. asked him to become the Assistant Pastor at Tabernacle Missionary Baptist Church. There are three wonderful children evolving from his blended family; Jessica, Jasmine and Errick C. Peck. Assistant Pastor Peck was challenge by Pastor Bailey to come up with a class to help train or confirm other associate ministers. With God’s help, Reverend Peck developed a monthly Ministerial class to develop ministers in areas such as: Armor Bearer, Sermon preparation, application and delivery of sermons, conducting funeral services, committals, baptisms, Christenings, pulpit etiquette, communion services and more. He was the Assistant Pastor for 12 years helping and serving his church until God called him to Pastorship. On Palm Sunday 2009, Reverend Errick Peck became the founder and Pastor of Citadel Missionary Baptist Church. He currently attends I.U.P.U.I of Indianapolis seeking a Bachelors degree in Organizational leadership supervision and a minor in religious education. He is a member of the Union District Association and participates in the Young Pastors and ministers division. Pastor Peck is a devoted husband, father and Pastor of Citadel’s people; Working daily “Proclaiming the good news while growing in grace”.